Images of the three couriers encountered in world interactions (the Bosmer, Imperial, and Nord ones). Couriers are generic NPCs who travel to deliver messages. They can be randomly encountered, and will appear to hand you letters related to certain quests. A courier can appear anywhere in the province of Skyrim, as well as on Solstheim. The randomly encountered courier can either be a Bosmer, Imperial, or Nord. The Bosmer is clad in a set of farm clothes and boots, and carries a leveled dagger that can be up to Daedric in quality, a random book of low value, a courier's letter that you can pickpocket, and an assortment of middle-class items and gold. The Imperial carries the same items as the Bosmer, but wears a hat as well as different clothes. Likewise, the Nord courier has the same inventory as the Bosmer, except for an additional random book and wears a different hat, clothes, and boots. They can be found walking along a road. Any attempts at conversation will only have them tell you, "Important deliveries to make! No time for chatting!" 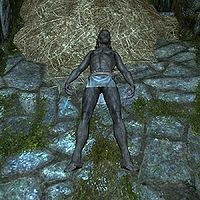 During the quest Arniel's Endeavor, you are to locate a different courier from Morrowind, albeit already dead when you arrive. He was a Dunmer and wore a set of farm clothes and boots, and carried Keening. 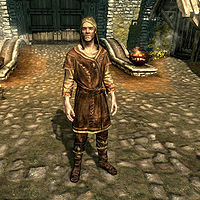 The courier that delivers letters to you is a Nord wearing random farm clothes, boots, as well as a hat. Unlike the other couriers, he carries nothing else with him. He will only appear as part of certain quests, tasked to ensure important messages are in your hands. Using a dragon shout in public view can increase the probability of a contact with him; after doing so, he will usually appear some time later with a letter that activates a miscellaneous quest. He will also occasionally bring other kinds of messages, as detailed below. "Don't know. Creepy fella, black robe. Couldn't see his face. Paid me a pretty sum to get that into your hands, though." Once he is done, he will say, "Looks like that's it. Got to go." and walk away from you. If you talk to him again, he will only say, "Nope, sorry. Nothing." UnearthedDB: Assist Ralis Sedarys in his search for the relics of Ahzidal in Kolbjorn Barrow. You can read the note while looking at his inventory via pickpocketing, therefore avoiding any risk of being caught. Reading the courier's letter will add the named location to your map, if you haven't already found it. The courier occasionally arrives wearing little or no clothes, which he never replaces. Each subsequent meeting with him will either see him wearing the same or even less clothing. This can sometimes be fixed by reverse-pickpocketing new armor or clothes onto him. This page was last modified on 8 April 2019, at 21:24.